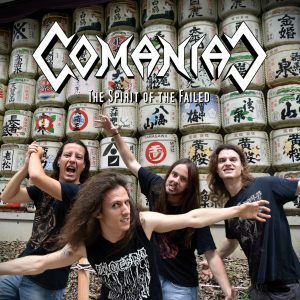 We’re happy to release the yet unreleased song “The Spirit Of The Failed” which is on the “Instruction For Destruction [Japan Edition]”. The Album was physically released on August 24th, 2018 via Captured Records on the “Kamikaze – The Spirit of Japan Tour” taking place in Aug/Sep 2018. That’s why the new song comes with only the best footage of the Japan tour, available on YouTube exclusively. Click here to get to the new Video Clip. This newest product of crime was originally recorded through the “Instruction For Destruction” recording sessions but was not featured on Comaniacs second album (Release: April 7th 2017). Get “The Spirit Of The Failed” on Bandcamp or on any digital platform.